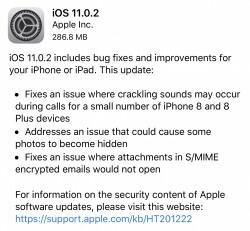 That's especially true if you have an iPhone 8 or 8 Plus and have had crackling sounds during phone calls, as this release will fix the bug that caused that. Also taken care of is a bug that caused some photos not to show up in your libraries, and an issue relating to attachments in encrypted email has been resolved too. With so many bugs it looks like a jungle. suggest you to buy iphone x ? LOL !!!!! Apple i am enough with you ! !